BestMARC can be used to easily find already cataloged records and customize them to your needs, or create brand new records from scratch. BestMARC contains a database of pre-screened records of high quality to use or search additional servers on the internet that someone else might have cataloged. If a record still cannot be found, enter the basic information into BestMARC and use the errors and warnings section to quickly and easily create a base MARC record that can be used right away. Click the Create pane if it is not already selected. 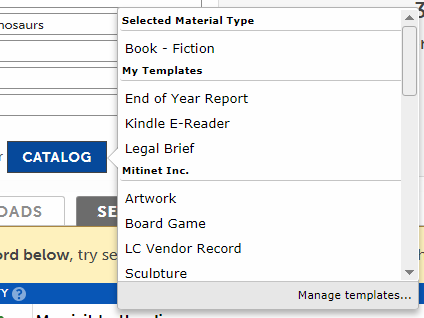 Select the type of material you are looking for and enter as much information about your record as you know. At minimum, you must have an ISBN, Author, or Title. The more information you enter, the better BestMARC can rank the records to match what you are looking for. 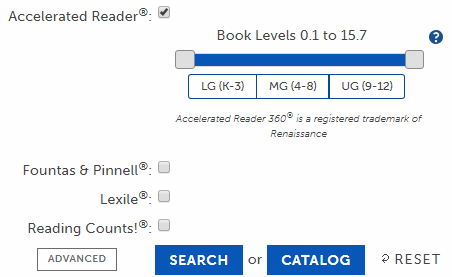 If you wish to search only within certain Reading Program ranges, click the Advanced button to see additional search options. Click Search. The Search results tab appears. The Related Terms section display terms related to your search. Click on a term to add it to your search. If you change any search terms, click Search again to perform your search. To clear all the search criteria and start over, click Reset. If this was the first time performing a search, the Search More Servers section displays first. If a record cannot be found in the following list, click this button to perform a more extensive search. A cover image if available. Click on it to see a larger version. The record's material type. If it matches the material type you searched for, it appears in bold. The source of the record. How closely the result matches the given search criteria. Entering more search criteria will improve the results. 100 means every search criteria was entered and matched. 0 means no criteria matched. The quality of the MARC record itself. The higher the number, the better the quality. The record's details. Result data that matches the search criteria appear in bold. If reading program information is available for this record, it is displayed here. Use an Advanced Filter to find only records with scores. If your Profile is set to use Reading Program Updates and a reading program that you use is listed in this column, it will automatically be added to the record. Click to open the record in the MARC editor. The record will be opened using the Profile settings you've set. Make any changes you like and when you click Save, the record will be saved into the My Records grid. You can also click Cancel and no changes will be made. The results from the Search More Servers request are added to another database that BestMARC uses for all future searches, displaying as Other database records. Therefore, by searching for new or hard-to-find materials, you improve the search results for all BestMARC users. If you still cannot find your record, make sure you don't have any misspellings and that you've entered as much information about the item as you know and try again. If you still cannot find it, you can turn your search criteria into a MARC record by Cataloging it. If you've tried searching for your record and a Search More Servers request and still cannot find a MARC record, you can easily turn your search criteria into a ready-to-use MARC record. Ensure you have filled out your Profile so the record will be created using your preferred cataloging rules. Select the appropriate Material type. This will be the record template that is used to create your MARC. Pages: enter just the numbers. p. or pages will get added automatically based on your Profile's cataloging standard setting. If you enter something other than numbers, it will be added exactly as you entered it. Click a template to start this new record from. The first option always matches the Material Type selected in the Create pane. The other options are custom Templates you've created. This defines the default fields and subfields for this record. A new MARC record is created and opened in the MARC editor based on the entered criteria and your Profile settings. All of the criteria is added automatically to their designated fields and subfields. Use the editor's Tips & Examples to verify that all of the information has been added correctly. Use the editor's Errors & Warnings section to help fill out the rest of the suggested fields. Click on an error or warning to take you directly to the field to fill out and use the Tips & Examples to determine what to enter. For subject headings, use the Subject Explorer to help you find appropriate subjects to add. Try to add 3-5 subject headings. Click Save. The record will be saved into the My Records grid. Advanced filters can be used to display only records that fall within a certain reading program range. Click Advanced to display additional search options. Check the box next to the reading program you wish to filter on. Drag the sliders to select the minimum and maximum score to include in your result. Click the labels under the range slider to select only those record with the qualifiers you want selected. If none are selected, any are allowed. If multiple reading programs are selected, a record must match all filters in order to be returned. Your Profile contains settings specific to your library such as the Library Automation System you use, whether you catalog using AACR2 or RDA, and what Reading Programs you use. You can set up these preferences by clicking on Profile at the top of the page.